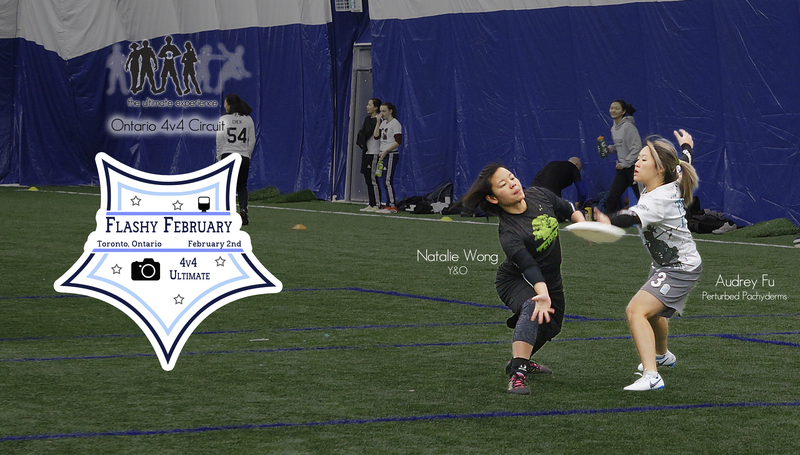 Our 2018-2019 Ontario 4v4 Circuit kicked off the new season with a bang this past Saturday. Teams from several different cities converged on Toronto, just as the first freezing temperatures of the year reached us. We saw teams from North Bay, London, Guelph, Hamilton, Bowmanville, and of course Toronto, compete in the initial tournament, Nefarious November. Located on the west side of Toronto, Lamport Stadium was our home for this showdown. The stadium has undergone some upgrades since last year, and our participants got to experience the joy of running on some of the newest turf in the city. As a special bonus, when you leave you don’t take half the field home and look like you got in a fight with an artificial Christmas tree. Play began quickly with some hot matches to start the day. 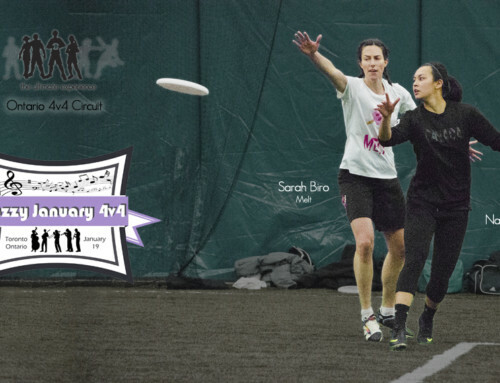 Perennial contenders Tetraphobia were back and squared off against new-to-the-circuit A-Z, made up with some of the best open and women’s club players. A close match saw Tetraphobia come out on top with a score of 14-12. 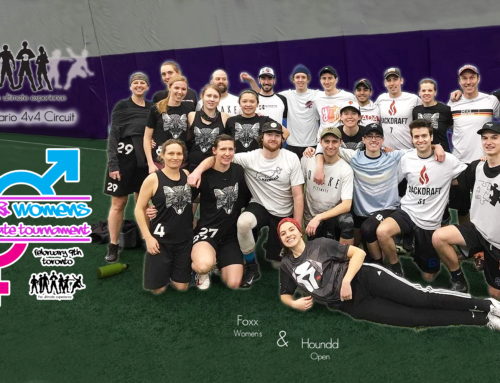 A-Z would continue their day with a series of one-point wins over more of last year’s regional contenders; 11-10 over Fluid, and 14-13 over YUM. Looking across the rest of the pack, two local teams Helen!Helen! and MONSTERS played off to a 10-9 victory for Helen!Helen!. MONSTERS would need to wait until later in the day to pick up their only win of the tournament over North Bay’s Frankenstein. A special shout out to MONSTERS‘ Nano who has been visiting Toronto for the past few months and heads back to Japan soon. Is 4v4 a thing there? If not, maybe it soon will be! Helen!Helen! would go on to win over returning team from London, Ray’s Balls, in a 12-11 victory. Towards the middle of the day, Fluid faced Tetraphobia in a close game, getting off to an early lead. 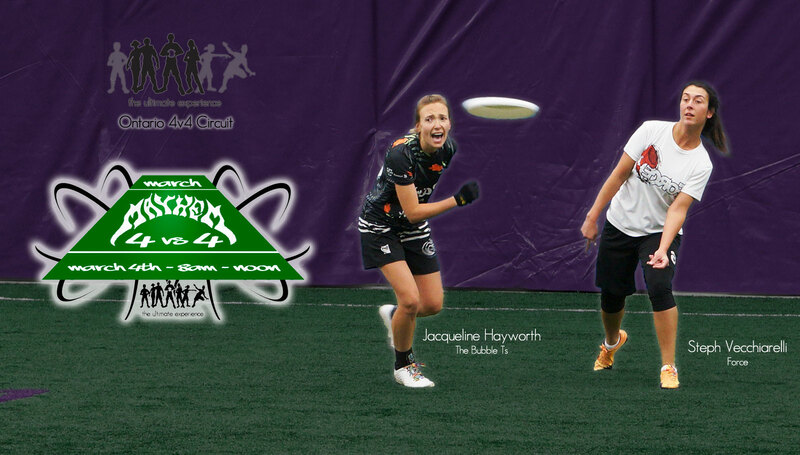 A late push from Tetraphobia wasn’t enough to get back and Fluid took the win 13-11. Tetraphobia was on their 4th game with only three gentlemen due to a car accident in the icy winter conditions. Their remaining two team members were shaken, but still made it via a rental car to play in the final game of the day against SGS – which Tetraphobia would also lose. We’re happy to hear everyone is okay! Remember folks, drive safe to the rest of our winter series events! 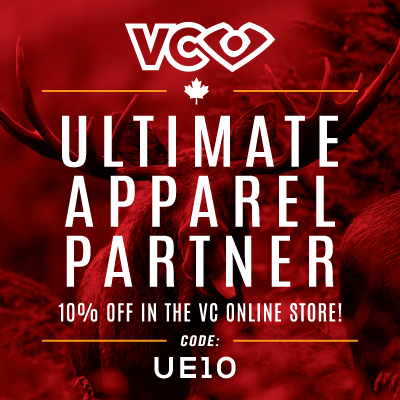 We love Ultimate, but we also love all of you! 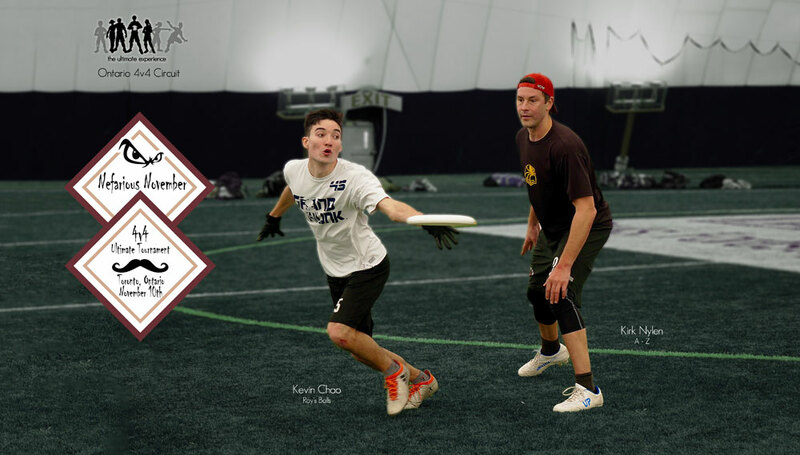 Fluid also took a close win against Big Disc Plays, a team made up of some of the best up-and-coming talent in Toronto. A few more years of experience and these young men and women will be unstoppable! 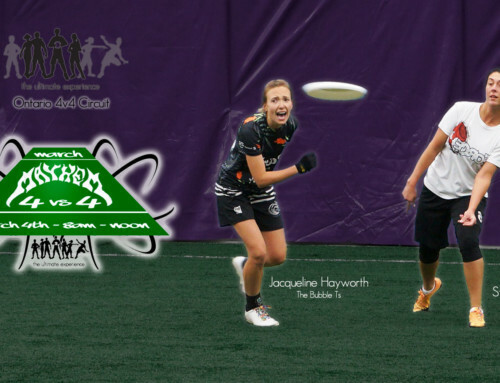 Perturbed Pachyderms would offer up Fluid’s second loss of the day with a 12-10 victory for the edgy elephants. Shout out to Ray’s Balls who delighted their competition with their spirited play and earned top marks for Spirit this tournament. 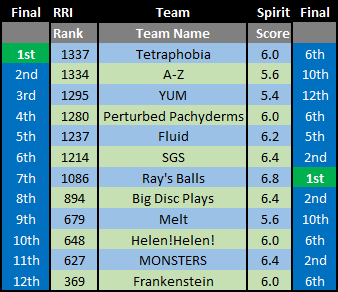 And congrats to Tetraphobia for managing to narrowly prove to be the strongest team overall, in spite of dropping two games on the day. Next up! Dreamy December lands in Toronto on December 15th! 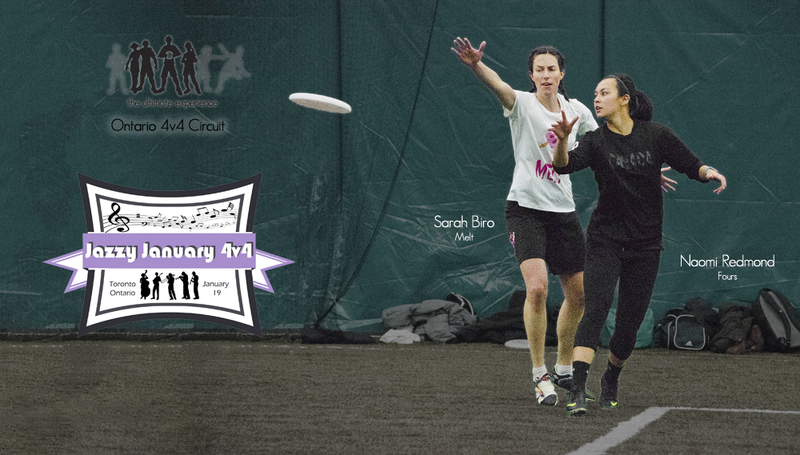 Registration is open for three more 4v4 tournaments: Guelph 4 Grain, Hammer 4v4, and Electric City. Register quick – our last events sold out in a week! The crew of Ray’s Balls first showed up on our radar with our Wasaga Beach Tournament. 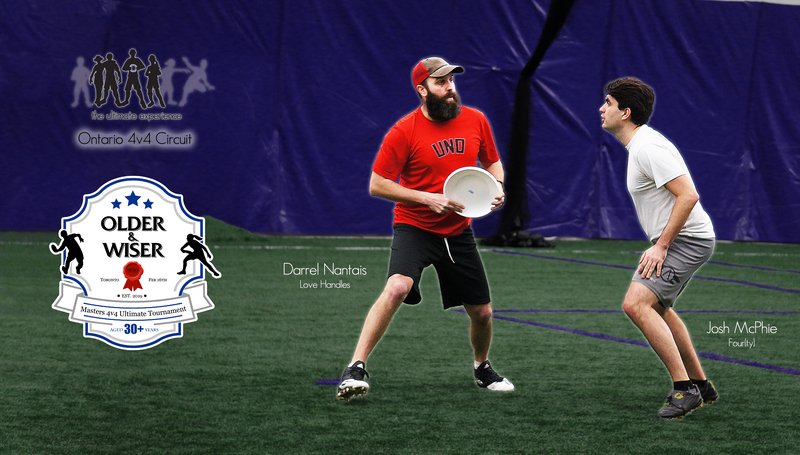 Always fun in the sun, we were thrilled to see them pop up at our indoor 4v4 tournaments in 2017. Through the 2017-2018 season they attended several of our events, narrowly missing out on a bid to Regionals last year. Through all the events, they have always provided a high level of spirited competition and some incredible playing on the field. 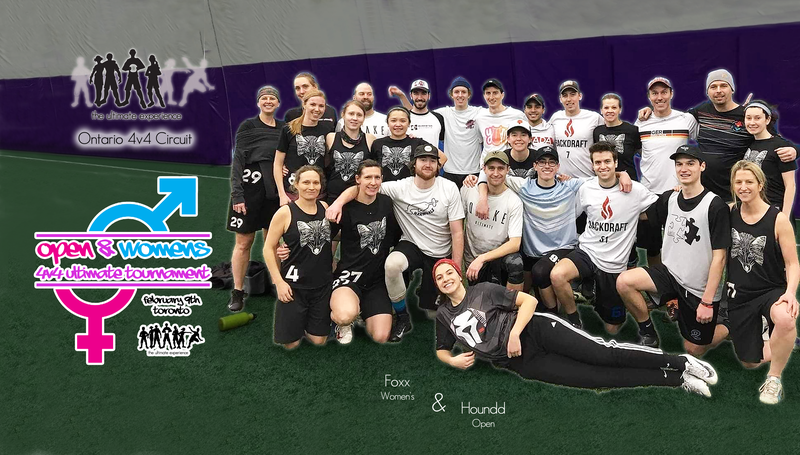 To kick off our 2018-2019 season, they have registered for our first two tournaments and took home top spirit honours at the Nefarious November event. We look forward to seeing more of them! Register Now for Guelph 4 Grain! 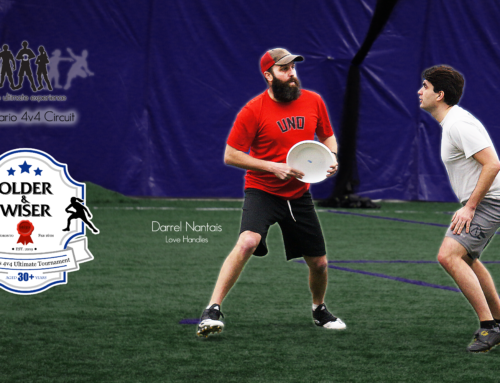 Register now for Electric City! 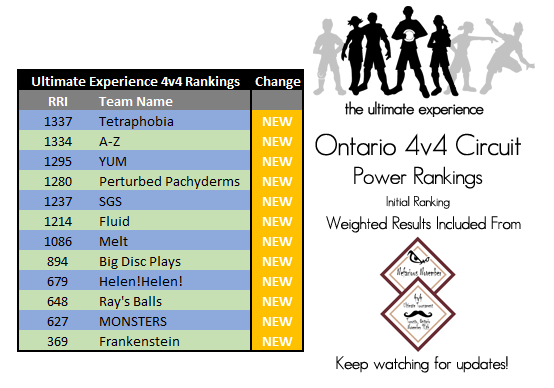 By playing in Nefarious November, all teams are now registered for our Ontario 4v4 Circuit. This year there will be more events, and more competition, than ever! Our first two events sold out in just over a week – and registration has opened for more events in 2019 and more to come. We can’t wait to host you this season! Stay tuned to our Facebook page, and our website, as we release further details around the series, some special events we are planning, and more. Don’t need a long explanation, but how does a team with 2 loses finish higher in the rankings than a team with 1 loss? Strength of schedule? Total +/- is more important than W/L? Hi Kevin, we appreciate the question! There were actually two teams that only had a single loss (no team won all their games) but neither finished top. Short answer, you’ve already kind of figured it out – strength of your opponents (and yourselves) combined with each game’s point spread. 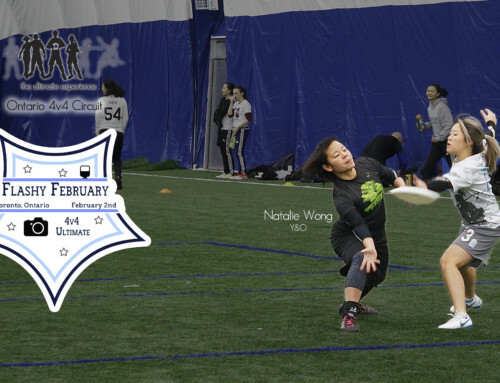 We used a Relative Ranked Index for the Circuit, similar to the USAU’s Club Ranking Index. It has the advantage of making every point count, regardless of who you’re playing against, which encourages better play overall. It also allows us to more accurately compare two teams, even if they didn’t play each other. As a result, a strong team narrowly beating a weak team may have a greater effect (on both their relative positions), than a narrow loss by one strong team to another. While sometimes not as satisfying as a pure win-loss result, I think you’ll find that over the course of a season, the ranking is much more indicative of team’s true positioning. If you have any further questions, please feel free to reach out to us directly!